The Japanese treatment of prisoners of war in World War II has been written about before, but only with this chronicle will readers come to appreciate the true dimensions of the Allied POW experience at sea. It is a disturbing story that for many made the Bataan Death March pale by comparison. The survivors describe their ordeal in the Japanese hellships as the absolute worst experience of their captivity. Crammed by the thousands into the holds of ships and moved from island to island and put to work, they endured all the horrors of the prison camps magnified ten-fold. Gregory Michno draws on American, British, Australian, and Dutch POW accounts as well as Japanese convoy histories, recently declassified radio intelligence reports, and a wealth of archival sources to present for the first time a detailed picture of what happened and the extent of the prisoners involved. His findings are startling. More than 150,000 Allied prisoners were transported in the hellships with more than 21,000 fatalities. While many of the deaths were attributable to beatings, starvation, disease, and lack of food and water, the most, Michno reports, were caused by Allied bombs, bullets, and torpedoes. He further reports that this so-called friendly fire was not always accidental--apparently at times it was more important to sink Japanese ships than to worry about POWs. 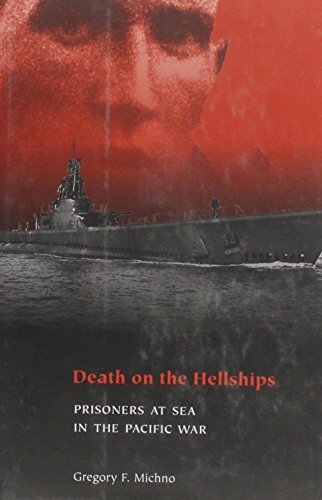 The statistics led Michno to conclude that it was more lethal to be a prisoner on the Japanese hellships than a U.S. Marine fighting in the campaign. His careful examination of the role of U.S. submarines in the sinkings and the rescue of POWs makes yet another significant contribution to the history of the war in the Pacific. Gregory F. Michno has won numerous awards for his books, which include Lakota Noon, an Indian perspective to the Battle of Little Bighorn. He works for the State of Michigan's Family Independence Agency in Ypsilanti.